I was gonna say something like, "The next time you're Ghana make a pun, Kenya put a little more effort into it?" But then I thought, "People who live in grass houses shouldn't throw stones." You Congo a bit too far, bwana. 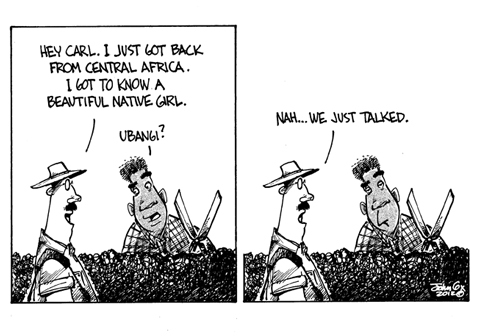 Do you think maybe you Bantu politically incorrect? You should be given Machu Picchu for that one! "Sorry I'm late, I was playing cards with the natives." Evidently, no good cartoon goes unPUNished. That native guy I was playing cards with? Egypt me. Well, once you throw country names into the mix, they'll never Libya alone.... But there's no sense in Cairo-ing over spilled milk. Click tock, people... Click tock. This page contains a single entry from the blog posted on May 15, 2012 10:12 AM. The previous post in this blog was Illustration Friday: KERNEL.